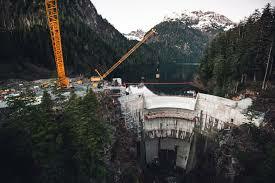 The Blue Lake Dam Expansion project located in Sitka, Alaska typifies the definition of collaboration. Outside of its rural location, the project was extremely complex, required sophisticated multi-disciplined team members, and presented a number of logistical and access challenges. 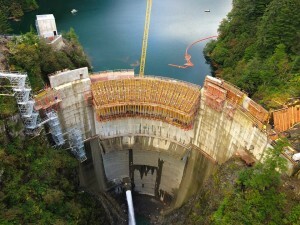 The project scope involved increasing the 145-ft-tall height of the existing dam an additional 83 feet which brought the dam to its maximum geotechnical height of 230 feet. In addition the project called for the construction of a new hydroelectric powerhouse, tunnel construction and modification, addition of new transformers and switchyard upgrades, and the creation of a temporary water treatment facility that supplied water to the community during critical phases of the project. The Blue Lake is an important source of hydroelectric power generation for the region and it provides drinking water for the town of Sitka. Despite such an intense project the city of Sitka never lost access to clean drinking water, due to exceptional teamwork and innovation delivered by the project team. Like many large, sophisticated, multi-stakeholder driven projects the Blue Dam Expansion presented a number of challenges that had to be overcome by the project team. With a construction budget of $92.5-million the project was closely monitored and evaluated by private/public stakeholders and members of the local community. The Alaskan region of the country where the dam is located is one of the rainiest areas in the United States with more than 100 inches of rainfall annually. As a result seasonal lake levels played a major role in project delivery. Weather impacts as a result of seasonal change were addressed by utilizing a fast track schedule to hit time-sensitive deliverables which potentially posed significant stoppage time to project activity if missed. In addition to weather and stakeholder pressures, the only access to the construction site was a narrow dirt road along a steep canyon that required meticulous thought and planning related to how manpower and materials were supplied to the dam. The remote location necessitated delivery of all major materials via barge which required extensive lead time coordination in order to maintain schedule. Lastly and most importantly keeping every person safe, every day, on a dam structure 230 feet above the ground with an active overhead material cranes in use had to be a major point of emphasis for all project participants, especially the general contractor. So now we must pose the question. How does a project with the aforementioned challenges and complexity successfully get delivered? The answer is collaboration. Team members from Barnard Construction Company, Inc., general contractor for the project attributed the ability to overcome project challenges to a strong collaborative approach that emphasized planning and communication from project kick-off through completion. As a result of innovation and collaboration the project was completed ahead of schedule, within budget, and in accordance with stringent quality specifications. In the world of construction, schedule, budget and quality are the holy triumvirate that governs success versus failure. The Blue Lake Dam was an undeniable success As a testament to this projects success and achievement it was awarded the prestigious 2016 Alliant Build America Grand Award, as well as winning the Alliant Build America award for both the Federal project and Renovation project categories. In addition the project also received the Marvin M. Black Excellence in Partnering Merit Award. At the end of the day the Blue Lake Expansion project is an example of what we can build as an industry, and all that we can create together through collaboration.